Diverticula are small pouches or bulges that form in the wall of your large bowel (your colon or large intestine). Diverticula is plural. One pouch is a diverticulum. Diverticula don't always cause symptoms or problems. If you have them without any symptoms, it's called diverticulosis. It's a common condition among older people, affecting around 80% of people over 80 years old. If you have diverticulosis with symptoms like cramps or bloating with diarrhoea or constipation, it's called diverticular disease. 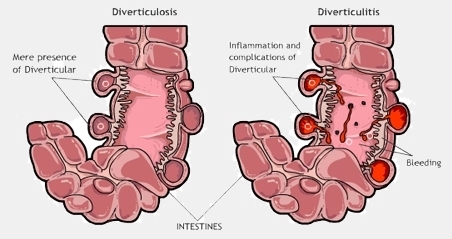 Diverticulitis is when the diverticulum become inflamed or infected. This can cause symptoms such as lower tummy (abdominal) pain or bloating. An abscess may form, or the diverticulum may burst causing inflammation inside to your whole tummy area (peritonitis). The inflammation can burrow into nearby organs such as the bladder or cause a narrowing of the bowel. Bleeding from the small blood vessels at the neck of a diverticulum can happen. In some cases, this can be quite serious bleeding. It's important to tell your GP about any bleeding from your bottom to have it assessed, and to rule out more serious causes. When you eat food containing fibre (usually plant matter), it forms the bulk of your stool (poo) so that other waste can be easily removed from your body. The stool is moved along your gut by gentle contraction of the muscles in your gut wall. If you don't eat enough fibre you can become more constipated as your stools become harder. To pass harder stools your bowel has to contract more forcefully, putting pressure on weaker parts of your gut wall. This causes bulges in the gut wall called diverticula. You might have diverticular without any symptoms. Sometimes, they're diagnosed after having a scan or colonoscopy. If you have diverticular disease, you might feel occasional cramp or pain in your lower tummy. You'll feel it most on your left side and it may also cause some bloating feelings. Your stools may change and be looser (diarrhoea) or hard and small (constipated). Going to the toilet may help ease the pain or bloating. Diverticulitis starts when some stool gets stuck in a diverticula and causes infection and inflammation. If this happens, you may feel more severe or constant tummy pain, constipation or diarrhoea, nausea (feeling sick), vomiting, and fever. You can get several complications if you've developed diverticulitis. These are uncommon but serious and will often need surgical treatment. an abscess forming next to the infected diverticula, or somewhere else in your tummy. a hole in your bowel wall (perforation) causing its contents to spill into your abdomen and cause an infection (peritonitis). If any of these complications develop, you'll need to go to hospital and have a CT scan so that treatment can be arranged. Having a high fibre diet helps to prevent diverticular disease. It keeps your bowel motions soft and helps prevent constipation. simple pain relief such as paracetamol. You may need to see your GP during this time to make sure things are settling down. Symptoms will generally go away within a week, but you may feel tired and a little sore for a couple of weeks. As you recover, you need to make sure that you're drinking plenty of fluids to reduce the chance of becoming constipated. You can gradually return to a high-fibre diet. If there are any signs of complications, you'll be referred to the hospital for further investigations and treatment. This may involve antibiotics, pain relief, and fluids given through a drip. It may also require other treatment such as drainage of an abscess, and very occasionally, an operation. If you have bleeding, you may need a colonoscopy to find the cause of your bleeding and rule out things like bowel cancer. If you have recurring issues with diverticular disease or diverticulitis you may need to be referred to the General Surgical Outpatient Clinic for review and further treatment as needed. This could include surgery. Having surgery involves some risks. Your surgeon will discuss the likely risks with you. Information about diverticular disease including causes, diagnosis and treatment. Information about the symptoms and treatment for diverticula and related conditions. Written by HealthInfo clinical advisers. Endorsed by General Surgeons Canterbury DHB. Last reviewed January 2019. Last updated February 2019. Canterbury Community HealthPathways – Diverticular Disease, retrieved February 2018. Colorectal Surgical Society of Australia and New Zealand – Diverticular Disease, retrieved December 2017. Patient.info – Diverticula, retrieved February 2018. NHS – Diverticular Disease and Diverticulitis, retrieved February 2018.